Women and children displaced from Jebel Marra, in North Darfur, due to fighting, take shelter in the Tawilla new arrivals site. Despite improvements in the security and humanitarian situation in Darfur, continued challenges remain, the United Nations Security Council has said, underlining the need for sustainable solutions for the region’s 2.7 million internally displaced persons. “The Security Council reiterates its demand that all parties to the conflict in Darfur create the conditions conducive to allowing the voluntary, informed, safe, dignified and sustainable return of refugees and internally displaced persons,” said the 15-member body in a Presidential Statement it adopted Wednesday. The Council also voiced concern that improvements in the security situation has not translated into a commensurate reduction in the level of human rights violations and abuses, such as sexual and gender-based violence, and serious violations against children, perpetrated with impunity. Further, the Council also said that six years after the adoption of the Doha Document for Peace in Darfur, the people of Darfur had yet to fully benefit from it. In that context, the UN body reiterated its support for the Doha Document as a viable framework for the peace process, and welcomed the signing of an African Union (AU) High-Level Implementation Panel road map by the Government and armed movements and urged them to make immediate progress on its implementation. Turning to the AU-UN Mission In Darfur (UNAMID), the Council said it was “still too early to reach conclusions on the full impact of [the Mission’s] reconfiguration” and requested that UNAMID and the UN country team closely monitor the reconfiguration’s impact on the ground and to promptly report back on any adverse effects. With phase two of UNAMID’s reconfiguration due to begin on 31 January, the Council said it supported a recommendation by the Chairperson of the AU Commission and the Secretary-General for a review – prior to the renewal of UNAMID’s mandate in June – that would consider a new mission concept with adjusted priorities reflective of trends and the situation on the ground. 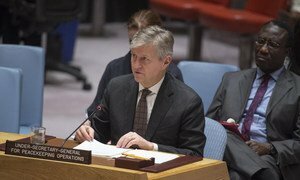 Despite some recent voluntary returns among those displaced in Sudan's Darfur region, lack of security, services and sustainable livelihoods in return areas have become major impediments to returns, the top United Nations peacekeeping official told the Security Council Wednesday.